Traditional dentures have their place in restorative dentistry. However, many patients complain of discomfort, changing fit and other problems all too common to these artificial teeth. What’s the alternative? Dr. Nelson Y. Howard, cosmetic dentist in San Marcos, delivers beautiful, natural-looking dentures supported by dental implants. If you wear dentures, you may be able to enjoy their superior fit, look and function, too. What bothers you about your partial or full denture? No matter what the issue, Dr. Nelson Y. Howard, dentist in San Marcos, may be able to solve it with implant-supported dentures. 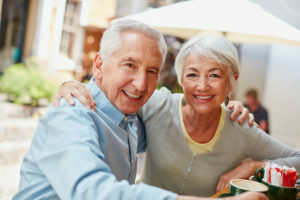 Unlike conventional dentures which are secured to natural teeth with metal clasps (partial dentures) or via the mouth’s own suction (full dentures), implant-supported prosthetics anchor into the jaw bone with titanium screws. They provide superior bone strength and stability. Plus, they last for years with normal use and care. Through oral examination, X-rays and other methods of precise imaging, Dr. Howard can tell if a patient has sufficient bone density and oral health to receive implants. If so, he can place one, two or multiple dental implants depending on how many teeth must be replaced. To begin any implant procedure, the dentist numbs the area, incises the gums and drills a pilot hole into the jawbone. Then, he places the titanium implant device into the bone and closes the site with sutures. Over the ensuing weeks, the implant site heals, and the bone bonds securely to the implant or implants. This bonding process is called osseointegration, and it practically guarantees the success and retention of dental implants. In fact, after healing is complete, biting and chewing actually exercise the jaw and strengthen the bond between the prosthetic and the bone. No other tooth replacement option offers that. In the case of implant-supported dentures, the prosthetic is custom-crafted according to oral impression and is mounted onto the implants’ extension posts in a way that best accommodates the patient’s oral function. With good care, the new dentures will serve the patient well for years. Care for the appliance just as you would a traditional denture. Cleanse with an ADA-approved soak or paste daily. Additionally, gently brush your oral tissues, and especially implant sites, with a soft brush and non-abrasive toothpaste. Floss around them daily to remove plaque and avoid hard tartar. Build-up of biofilm around implants can cause peri-implantitis, a destructive infection similar to gum disease. Despite the high success rate of dental implants (up to 98 percent say experts), implants can loosen and bone degrade if peri-implantitis occurs. Implant-supported dentures from Dr. Howard help you achieve both. This skilled dentist is founder and president of the West Coast Society for Cosmetic Dentistry, and he is fully certified in implant placement. Rest assured your smile is in capable hands. Contact Dr. Nelson Y. Howard for a dental implant consultation to learn about your options.